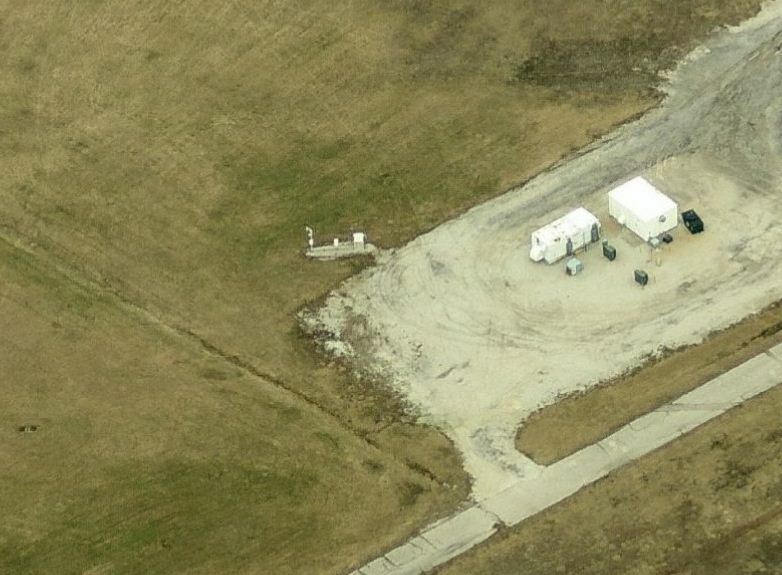 NWS Chicago demonstrates that climate math is hard | Watts Up With That? Did you spot the error? It is pretty blatant, and I’m not sure if it is a manual calculation error or an automatic algorithm gone awry. But again, why are all the errors we spot in the warm direction? Of course it is likely a rounding error up from 56.5°F compared to the round down from 57.5°F due to NOAA throwing out decimal values…except of course when calculating century scale trends for public consumption. UPDATE: A lot of people didn’t get what I was pointing to, and it is simply this. The average departure comes out zero, but we have two -1’s listed in the “departure from normal” column. This is an artifact of rounding to the nearest integer. By normal rounding rules, 56.5 would become 57 and 57.5 would become 58, leaving a average departure of -1. But in this case, 57.5 is rounded down to 57, leaving a departure of zero. In a guideline issued in mid-1966, the U.S.Office of the Federal Coordinator for Meteorology determined that weather data should be rounded to the nearest round number, with the “round half up” tie-breaking rule. For example, 1.5 rounded to integer should become 2, and −1.5 should become −1. Prior to that date, the tie-breaking rule was “round half away from zero”. Record the maximum, minimum, and current temperatures on WS Form E-15. Record to the nearest whole degree, even though the readings are displayed to the nearest tenth degree. If the last digit is a 5 (e.g., 43.5), round the temperature upward to the next higher whole degree (i.e., 44). If NOAA has another rule contrary to this for dealing with 0.5 in the context of reporting averages, I’m unaware of it. I’ll bet that many of you don’t know that the ICAO ID for O’Hare, is KORD, and FAA uses ORD which is what you see on airline luggage destination tags. “ORD” has nothing to do with the name O’Hare, which came after the airport was established. It has everything to do with the name “Orchard Place/Douglas Field” which is what the airport started out as, which at the time was far more rural than it was now. Note that there’s two electronics equipment buildings nearby with industrial sized a/c exhaust vents. While not USHCN, NCDC metadata lists O’Hare as a Class “A” station, which means it does in fact record climate. Data from O’Hare can be used to adjust other stations with missing nearby data. The point I’m making with all the photos is that airports are far from static, especially since airline deregulation in the 1980′s. The are just as dynamic as the cities they serve. We measure climate at a great many airports worldwide. E.M. Smith reports that the majority of the GHCN record is from airports. 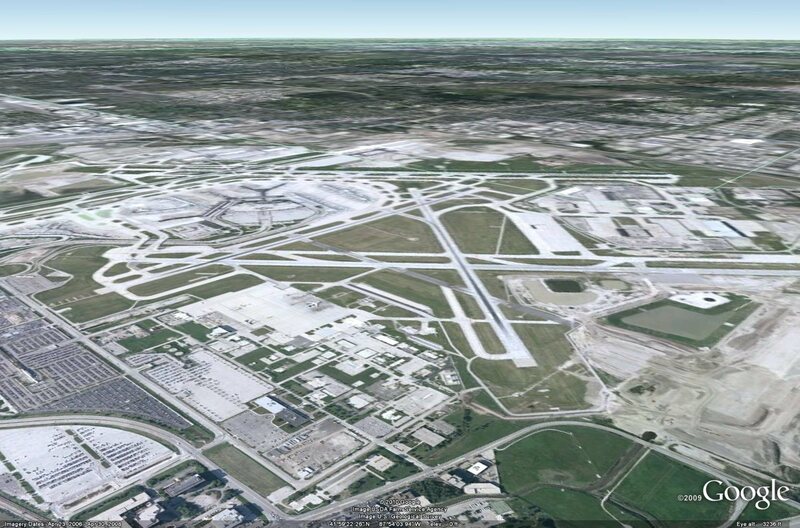 O’Hare airport is an extreme example of land use change around a place where climate has been measured long term. 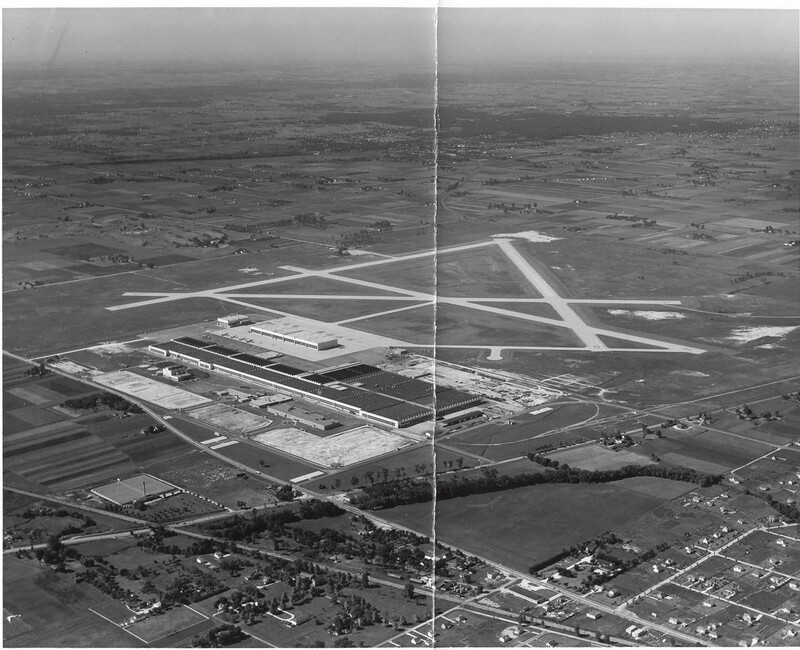 It went from being essentially rural, to a megaplex of aviation cast in concrete, asphalt, and terminals surrounded by suburbia. You can read about its early history here. The top error is fairly blatant. Although the daily average calculation is off, the heating DD calculation,1 less than normal, seems correct. WUWT? If 68 is normal and observed was 67…..wouldn’t the departure be -1 ?? Hey, good enough for government work. That was the first thing I checked, diff (obs-norm): max/min/avg, 67-68 = -1, 46-47 = -1, 57-57 = 0. Don’t see a problem. all the years are screwed up…..this is giving me a headache…..
Weird, they round to the nearest odd value. That’s how averaging 68/47 and 67/46 can turn out to be the same. That’s really strange. Most numerical systems round the nearest even value to eliminate rounding bias. If that was the scheme, you’d see the rounding mechanism exaggerating the difference with averages of 58 and 46 respectively for a difference of -2. Ultimately this is valid, but only if it is applied consistently. The rounding mechanism means the computation adds error to the system, so they have to account for that. I’d suggest looking through more data points to see if there is consistency. Yesterday was 1 degree cooler than normal: ie. -1 deg. Personally I would expect average daily temperature being average of all measurements taken in regular intervals rather than average of maximum and minimum temperature. As such I don’t see why it should be 56.5. And yes clearly there’s been a decision somewhere that this station’s temperatures are published at whole degrees Fahrenheit. I don’t think such decision introduces any kind of warming trend to the data, it just adds to noise. The first says the high temperature record was set last year. The second says 1982. So is the second entry for May 12? 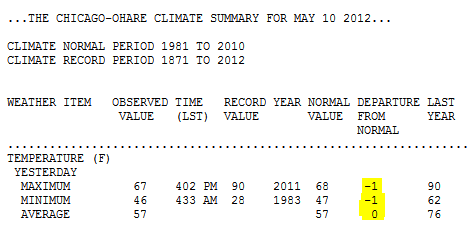 Date, Avg Low, Avg Hi, Record Low, Record Hi, Avg Precip., Avg. Snow. All this brings up the following question. The CAGW crowd loves to talk about “new high temperature records”. But if the new high is only 1 deg higher than the old, how do you know its REALLY a record, given the resolution of temperature measurements and the vagaries of siting, local climate, UHI, etc.? Maybe we can just call it a tie if it is +/ 1 deg F.
Observed minus normal = departure from normal. Negative departures are colder than normal. This is consistent all the way down the columns. I’m with Latitude, here. Not getting it. What am I missing? The average temperature for the day is NOT the average of the high and low. It’s the AVERAGE temperature over 24 hours. 115/2 = 57.5………but counted as 57……rounded down! why wouldn’t they round both in the same direction? Yep, it’s rounding, but in the long run, it’s no real problem. The daily mean is the arithmetic average of the max and min, and half the time the mean ends in .5, in which case it’s rounded up. But the monthly mean is the average of the mean max and the mean min, all of which are expressed in decimal degrees. So this rounding issue does not enter into the monthly, annual, etc. averages. Meanwhile, the “normals” for each day are estimated from the monthly normals via a cubic spline or some other fancy math, and are calculated to decimal degrees but published as rounded whole numbers. So, in this case, (67+46)/2 = 56.5 = 57 rounded. Meanwhile, the normals may be 67.6 and 46.6 (rounded 68 and 47). Averaging, (67.6+46.6)/2 = 57.1 = 57 rounded. So while this will skew the daily stats upwards by half a degree on half the days, it won’t skew the monthly or annual means. It will skew the degree days, though, since those are sums of daily whole degree values. BTW, I’m a co-op observer with a MMTS that reads to a tenth of a degree, but must round to the nearest whole degree for reporting to the MMTS. One could argue that rounding 0.5 upwards, rather than downwards, adds a little upward skewing, since if it’s really 45.45 degrees, the MMTS reads 45.5, and I’d report 46. I recall in college physics rounding .5’s to the nearest EVEN whole value, which would eliminate the bias in the long run. But the difference would be 0.1 degree at most, well within the other margins of error (however, equal to a decade of global warming?). No, Anthony, your “answer” has me beaten, too. disagrees with the 33 at the bottom, and both years are inside the “normals” range. What are they being paid for, then? The Min temp may have been 45.6 then rounded up to 46.
rounded up to give an Average of 57 Thats a +0.85f round up. I have been recording the temps for O’Hare, Midway, and Palwaukee for the past several years and believe me, their sloppiness is beyond comprehension. They routinely post their readings 20, 30, even 40 minutes after the time they claim they took the readings. There seems to be no rhyme or reason for their tardiness and false claims on their time stamp other than sleeping or f-ing off. Checking other days, they seem to have defined “Average” as the simple average of the high and low. I’m not sure what significance that figure would have, if any, but apparently they’ve rounded off the numbers differently. Close enough for government work. Why the rounding in the first place? Does it cost more to use decimals? The precision lost in rounding sure seems to be found when making doomsday headlines about tenths of a degree warming! In any case averaging a max and min daily temperature produces a meaningless value. It’s like averaging the temperature of two pots of water without knowing how big they are! As other commenters have noted, the weather calculation is right. 67-68=-1. Departure from the normal (68) is indeed -1. The “round-to-even” method has served as the ASTM (E-29) standard since 1940. Evidently NWS has adopted the round-to-odd method. The early mainframe computer architecture used the much simpler round-up method (they were intended to be used for accounting, particularly calculating bills!). When this architecture was applied to climate calculations before the mid-80’s, it introduced a positive round-off error that accumulated rapidly over millions of calculation, bothin forecasts and hind casts. It is my contention that before this systematic error was recognized the climatology community had already committed itself to dogmatic belief through funding bias in this spurious warming. OK Anthony, now I’ve seen Latitude’s comment I know what you are getting at. subtracting one value from another actually adds together the uncertainties in them. So I don’t think anyone should be worried about a 1 degree discrepancy between the average and the individual values. Still less so, if the figures are rounded from higher-precision values they haven’t given us. Jorge Kafkazar’s comment about what “average” actually means is moot, too. I’m joining the ranks of the confused here. Can’t see the problem. But the ‘NO SIGNIFICANT WEATHER’ was a laugh. Never mind, more weather tomorrow…. The chart is ambiguous. Anthony’s interpretation is that each number in the line marked AVERAGE contains the average of the two numbers above it. Another interpretation is that the line marked AVERAGE describes the average temperature of the day (calculated in some way which could be considerably different from the average of the high and low temperatures). Anthony (or anyone else familiar with weather bulletins): Is the first interpretation really correct? Is it documented anywhere? The update does not address my question. Anthony’s interpretation (which may be correct) is that the average temperature on the chart is calculated as the average of the high and low temperatures, which would indicate a rounding error. 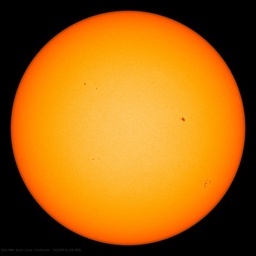 But there is another interpretation, which is that the average temperature is calculated some other way (such as the average of 1440 temperatures taken once each minute), which could correctly produce an average temperature that is higher than normal and high and low temperatures that are both lower than normal. Is there any documentation of what the numbers on the AVERAGE line mean? Erm..I too assumed ‘average’ was average (hourly or whatever) temp for the day, and had no connection with the minimum and maximum. Correct. The reference means that both the prevailing winds and the peak gust came in from 050 degrees. If a *minor* gust came in from the NNW, the wind direction would have been entered as “wind variable from 340 to 050” but the *peak* gust would still be listed as (50). The normal values of Maximum, Minimum, and Average all come from NCDC (normals) and are calculated independently of each other. The daily normal average temperature is frequently inconsistent with the mean of the normal max and min temperature. But as someone pointed out above, all these daily errors cancel out when the monthly average is computed. That said, are your sure their “sophisticated” software might not simply be truncating? Mr. Gates’ original Basic did just that! I wouldn’t doubt some of those systems might still be ROMBASIC! This may have been already addressed but when I was in high school ohh so many many years ago, I was taught that .5 rounds UP for odd numbers and DOWN for even numbers. Across a large set of numbers, this should even out. Any one set of rounding can produce these type of results; I’ve experienced that quite a few times, especially with weather data. Even so, according to the above rule, the calculations were not handled consistently. It’s just rounding errors. What’s one or two degrees between friends ;)! If you consistently rounded in a single direction your calculations would have a bias in the direction of your rounding. The mean temperature might gain as much as half a degree. Opposite if you round downward. By splitting the difference, the chance of a bias in your result is lowered. A related problem in rounding decimals is that there are an odd number of digits (1..9) and any simple rule (e.g. 0.5 or less round down, for 0.6 or more round up) means that five times out of nine, you round downward, which again biases your estimated mean slightly. One rule for that is to always round toward the odd number (or even). A little article on all the high end temperature records set prior to 1940 might show how far CAGW has to go to overtake history. You probably have the numbers at your fingertips? When you round, you introduce additional noise in the system. To always round up would introduce a systematic error. Therefore it is more accurate to introduce a white noise by randomly round up – or down. The average would then not suffer a systematic error larger than the additional white noise introduction. Is this an error or done on purpose? I wonder how much of the record is full of small tricks like these to boost temperatures up a bit. As TanGeng notes above, the “Navy rounding” rule — so-called because it was first formalized by navigators in the British Navy — is to round to the closest even number: 5.5 > 6 , 4.5 > 4 . The logic here is that a .5 in a calculation is nearly always due to division by 2 (or some multiple), and rounding to an even number reduces the probability that another such rounding will be necessary later in the (lengthy) calculation. I failed to find the definition of what the “AVERAGE” means but I have found that all their measurements are collected in degrees celsius with precision to 0.1°C – so the data in the form are informational at best and rounding to the nearest °F makes sense because the conversion would make strange patterns in the record anyway. Differences up to 1°F between any two numbers are to be expected. Personally I rather see the problem in how the “AVERAGE” is defined because if it really is calculated as average of minimum and maximum value then its informational value is rather limited – personally I’d say it has no sense at all. Look at Jo Nova’s article on Australian data. The more you look the worse it seems to get. I just bet they measured temperature with the same precision and accuracy in 1896 as they do today – did they even have max- min thermometers back then? OMG!!! I’ve introduced this kind of rounding to my 5th graders with learning disabilities about this very rule. And you are saying adults who should know better screwed this up????? Several tests for aptitude and achievement use this rounding rule (for example the Woodcock-Johnson). Hell, I thought everybody who works with data knows about the various ways to round. Apparently I was wrong. I am surprised to learn that the “average” is simply computed as the average of the max and min. I’ve always taken it to mean the average of the whole-day trendline. Not because I ever read that, but because you’d assume it was done that way because that’s the right way to do it. Oh well, never assume competence beyond the bare minimum, I guess. Well done, Anthony, to point this out. To expand on this thought, I’m pretty sure that an “average” simply calculated from the high and low, would be higher than the average calculated over the whole-day trendline, simply because the afternoon is short & hot, but the night is long & cool. As a boy I was told the average was calculated over the whole day. Purely speculative, but if they *used* to calculate it over the whole day, but *now* they calculate it just by averaging the high & low, that would introduce a powerful warming signal! But surely there can’t be anything to such an idea, it’s just too tawdry. Here’s a site oddity for you. First look at the NWS overall for Spokane: beautifully dry and calm. Been that way for several blessed days, with more to come. Now look at the Fairchild AFB record. Fairchild is about 10 miles west of downtown and often has cooler temps and stronger wind, but there’s absolutely no reason for the -RA and “drizzle”. No clouds anywhere in the whole region! This “drizzle” has been showing often in the Fairchild record for several weeks, on days when there was definitely no rain. For Climate Science, no technique for advancing truthiness is too tawdry. I am surprised to learn that the “average” is simply computed as the average of the max and min. I’ve always taken it to mean the average of the whole-day trendline. Not because I ever read that, but because you’d assume it was done that way because that’s the right way to do it. The reason for this goes back to the days of manually reading max/min thermometers. The Co-op observer would go out once a day to read and reset both the maximum and minimum thermometers. When I was in high school, my father brought home from work a retired disk temperature recorder that measured temperature with a thermocouple. (The amplifier section used vacuum tubes.) When I went to college, I typed in temperature datfor every hour (3 hours?) for a year’s worth of data, wrote a program to crunch the data and plotted it with ASCII art on the line printer. I forget the figures, but I was surprised at how well the average of max & min worked out. There were some obvious outliers, e.g. the cold front that came through at 0100, so the 0000 temperature was the high for the day, but fewer than I expected. OTOH, I wan’t looking for differences of a fraction of a degree, I was expecting to see 2-4 degree differences. Now, in this age of digital thermometers and instant communication, you might think we’d do what hundreds of kids do automatically on Wunderground.com, but now, we still haven’t figured out averaging numbers and think that (-1) + (-1) = 0. So, sorry to add to the conspiracy here, but it’s worse than portrayed. Someone may already have said this, but *one* of the standard ways to round numbers ending in “5” is to round to the nearest *even* number. The way that most random number generators work you can only get an average that agrees with the expected average for the generator by using this algorithm (as opposed to always rounding “5” up). For instance, go by the Wolfram Alpha site and round 57.5 and 56.5 to see what Wolfram thinks the answers are. The alternative explanation is that they hold more digits during the calculation and only report to integer values. That’s a perfectly reasonable possibility. Did anyone ask? O’Hare airport is an extreme example of land use change around a place where climate has been measured long term. NWS near my home has the same problem. I checked April and found 7 instances. In May so far there are 5. But I found that it doesn’t effect the monthly departure. I went ahead and replaced the proper daily departure, did the math, and it still came out the same as listed on their monthly reports. That’s what any half-decent engineer (or any competent programmer) would do. You never round until the final display.